Ada Malagnino (right) from the University of Salento, Italy, is visiting our group for six months. Her PhD topic deals with the management of safety design and fire safety assessment during building renovations. The focus is on the utilization of Building Information Modelling on fire safety management. Guilherme Fraga (left) is a PhD student at Universidade Federal Do Rio Grande Do Sul, Brazil. His research topic is turbulence-radiation interaction, and he has already implemented different spectral models of radiation medium into FDS. The purpose os Guilherme’s short visit is to make some of these models available for all FDS users, and to investigate if we can improve the accuracy of radiation predictions with WSGG models. Eetu Veikkanen (middle) started his MSc thesis on the effectiveness of fire sprinklers in protecting the life safety of patients in hospital fires. 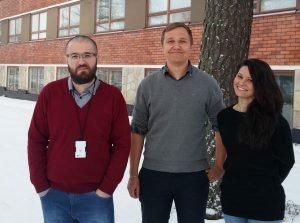 He will analyze the data that we collected with VTT in fall 2018 in Sysmä.